For close votes, we are provided a number of reasons. One reason, in particular, is for being off-topic because it belongs on a different Stack Exchange network, takes you to a list view of related and potentially appropriate SE network sites for the question to belong. I've always hated this implementation, because it is a very short list on every SE network site (it really should just be the same accordion menu as the site's top-left StackExchange site list), but EL&U, I think, takes the cake; the only option on the list is EL&U meta. That means this specific option for CVs is nearly useless (I don't think the majority of questions asked here that belong elsewhere really define "elsewhere" as "EL&U meta"). I understand that sites usually have to come out of beta before migration can occur, though that's not always necessary. Well, English Language Learners has been in beta for over 1.6 years now (is SE trying to mimic the Google model? 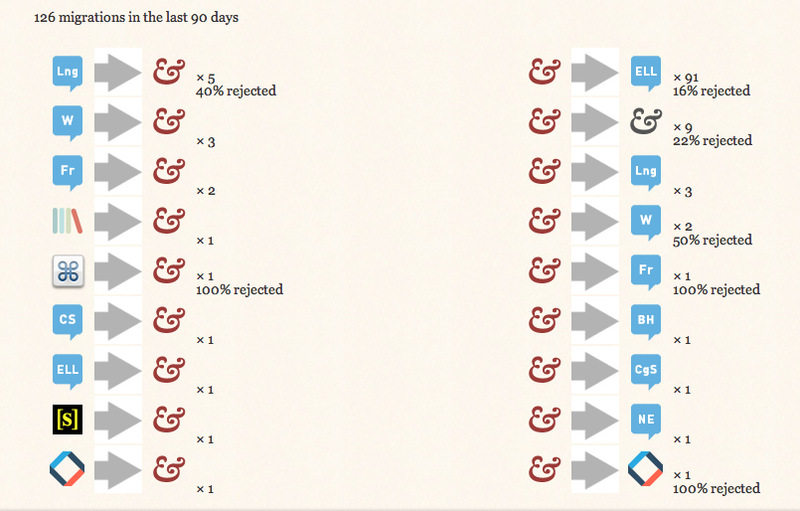 ), and seems to have passed beta requirements with flying colors, so when (will ELL move out of BETA?) might we add it to the aforementioned list? tl,dr: Making ELL a migration target for non-moderators risks making matters worse, not better. There is great confusion about what makes a question suitable for migration. The main problem here is not the betaness one. That’s a red herring. Rather, the real reason the migration list is always a very a short list on all SE sites is because users, even experienced ones, have time and again proven themselves to be poor judges of what counts as a valid question on the receiving site. Instead, when they just don’t like the bad question, rather than downvoting or closevoting, they try to sweep all the dirt under somebody else’s rug. That makes things worse, not better. More and more, question migration all across the SE network is being left in the hands of moderators, who normally contact the mod team of the other site to negotiate a hand-over. This makes more work for them, but not so much as it would make if any three users could send garbage questions whithersoever they pleased. Anything that is blue-for-beta migration site is one that was a mod-only migration, and even these still fail. 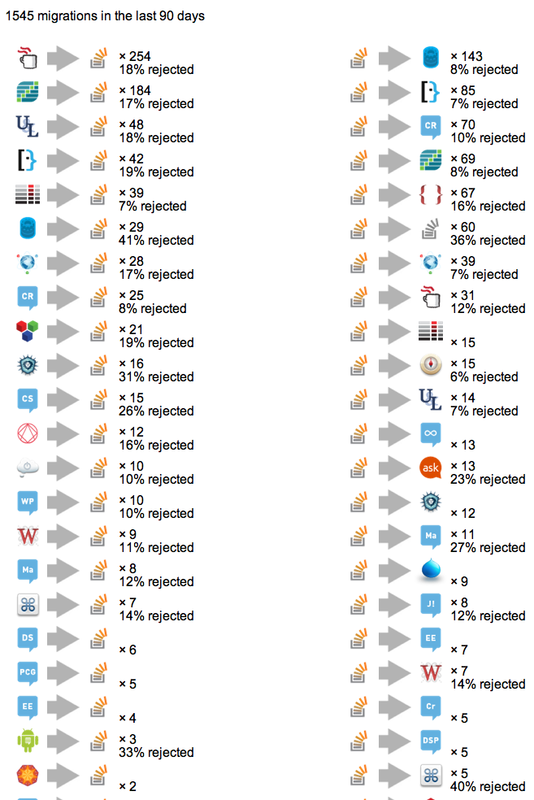 I believe that no matter whether ELL is a beta site or not, that making it an available migration target to non-moderators would result only in a higher rate of failed migrations. This is because too many ELU users are unfamiliar with ELL or consider it a dumping ground for poor NNS questions. I therefore do not see how having more failed migrations would help anything. I have a hunch that it would hurt things, even. If you believe something should be migrated, flag it for moderator attention with a custom message to that effect. Not the answer you're looking for? 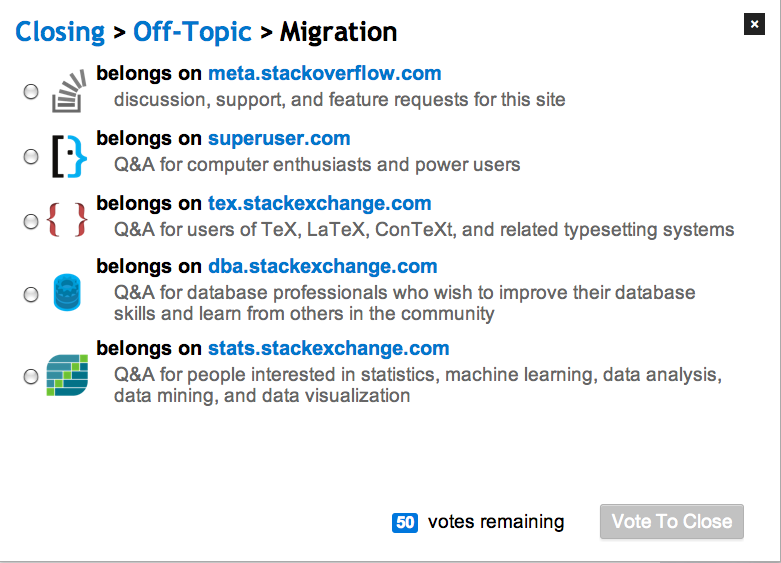 Browse other questions tagged discussion appropriate-questions vote-to-close migration .